Mr Sankalp Kohli , author of best sellers, at IIM Indore Mumbai campus. The first year started with an exciting event for PGP 2014-16 batch of IIM Indore Mumbai Campus. While the students were getting acclimatized to the humid Mumbai environment, amidst the hectic schedule of assignments and case studies, they got a relief in the form of an interactive guest session with the author of the best sellers, ‘Every raindrop is hope’ and ‘When I found you’, Mr. Sankalp Kohli. 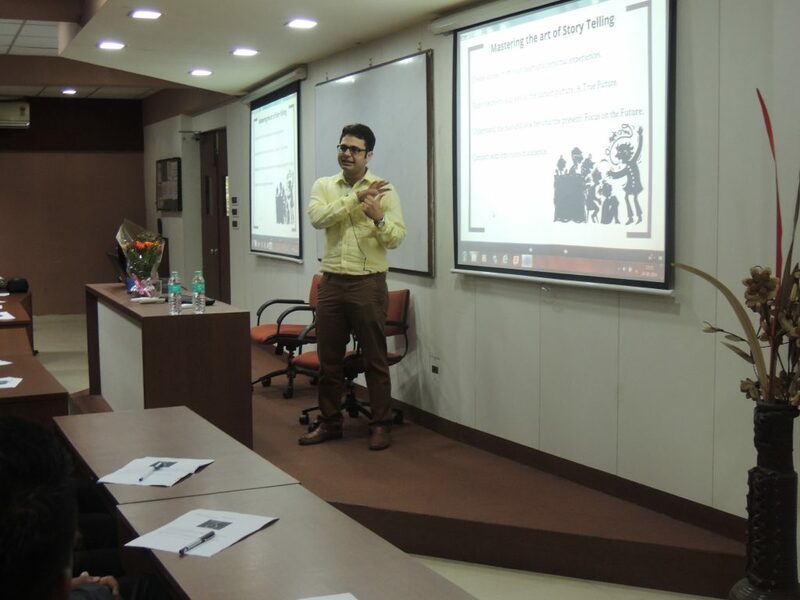 An alumnus of NMIMS Mumbai and Assistant Manager at Idea Cellular, Mr Kohli was at IIM Indore, Mumbai campus to interact with the students on the topic of “Lead with a story”. He asked the students about which form of data do they recall easily? Stated facts or stories? The unanimous answer was stories. We have been learning through stories since our childhood, it’s the way we interact. He told the importance of weaving a story around a message to deliver it in a better way. He also explained the need of better communication in organisations. He explained how brands like Google and Apple have been telling us wonderful stories to sell their product. He later told some of his own experiences, were stories helped him bond with various personalities. He concluded with a message that, stories are powerful tools to express oneself, be it a sales pitch or a placement interview. His session was a joyful ride with lot of fun activities. He asked students to build their own fictional stories and narrate them to the audience. He also gave the students a challenge to make stories around a product and present it to the audience. Everybody participated with great enthusiasm and had a lot of fun. Mr Kohli also talked about his journey as a writer & an entrepreneur. He told the students about the challenges he faced as a writer and how he overcame them. He also replied to the questions from the students about writing, publishing and marketing books. He then concluded the session, explaining about his upcoming book Hackster, Which is about a hacker who disrupts the entire political system of India. The younger extension of IIM Indore, located in the busy and happening city of Mumbai - we are a group of up and coming managers living in the city of dreams.